The photos from SportSunday are now available to buy and purchase from here: http://www.sportsunday.co.uk/beeston-sportive. Feed-stations are located around the route providing water top ups and additional food supplies. Toilet facilities are provided at the Recreation Ground, however, whilst out on the route, please consider other people (drivers/locals) and avoid going in public (e.g. at the roadside). This does not look good on the rider, the event or Beeston Cycling Club. If you arrive outside of these times the food stops may not be open. Please bring your own essential supplies. This event is insured by British Cycling and as such helmets are mandatory. Any rider involved in an accident whilst not wearing a helmet will be deemed to be not part of the event. Please avoid dropping litter on route. You can dispose of wrappers etc at feed stations or at the Recreation Ground. This number will be shown on the chip timing/number card you’ll be given on the day. However, so you have it in advance (to store it in your phone prior to the event), the number is: 07958 231499. If you require mobile assistance (short route only) this will be passed to the mobile unit. If there is a genuine emergency on the road please ring the emergency services first and then the event organisers. Additionally, it would be advisable to have the maps and links to the sportive website in your mobile for the day as backup information. 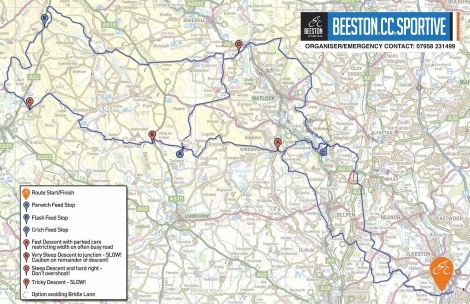 The route is fully signed with Beeston CC laminated signs. An example will be at the start. Please obtain route information from the links above. Reference maps will also be up at the Recreation Ground. Please ensure you use the map facilities provided or other independent means of navigation, as sadly tampering with signs is almost a certainty over such a large area and with such a large number of signs. If it becomes obvious that signs have been tampered with anywhere on the route, please contact the organiser or report it to other event staff immediately so this can be remedied. The finish is back at the Ilkeston Recreation Ground. To register your finish time please ride over the recording mats provided. IMPORTANT – THE ENTHUSIASM OF FINISHING CAN LEAD TO DANGEROUS ACTIONS BEING TAKEN (E.G. JUMPING THE TRAFFIC LIGHTS OR CUTTING ACROSS ROADS WITH NO CONSIDERATION TO OTHER ROAD USERS/PEDESTRIANS). PLEASE DO NOT DO THIS AS, APART FROM BEING DANGEROUS AND ILLEGAL, IT IS BAD FOR THE REPUTATION OF CYCLISTS IN GENERAL, THE EVENT RELIES ON GOOD LOCAL RELATIONSHIPS WHICH WILL BE DAMAGED BY SUCH BEHAVIOUR. Post event food will be served at the Recreation Ground on completion of the event. You ride under your own responsibility and must ride with due care and attention at all times, so as not to endanger your personal safety as well as others. You must follow the normal rules of the road at all times and be considerate and reasonable towards other road users. This is not a closed road event or a race. It is your responsibility to ensure your bicycle is well maintained and road worthy. Tri-bars - these are allowed as they are road legal, however the organiser recommends that you do not use these when riding close to other riders. Also, some descents are steep and the road condition poor in places, so please be cautious when choosing to ride on tri-bars. Thank you for entering and taking part in our club-run Sportive, we hope you enjoy your day!